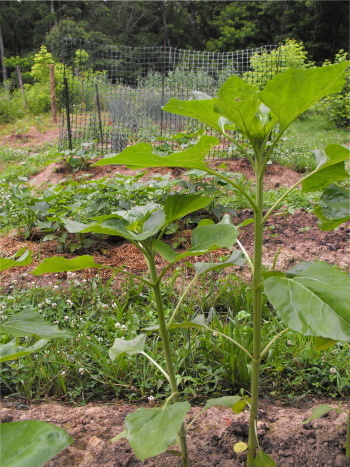 One of our future goals is to grow enough sunflower plants to turn the seeds into cooking oil. I'm not sure if the effort is worth the reward, but thats what experiments are for. Once you harvest the seeds they need to be dehulled. It takes about a pound of hulled seeds to produce 3 ounces of oil. I've read an area of 2500 square feet can provide a family of four with enough cooking oil for the year. There's even talk of it being used as a bio-fuel. I noticed the feed store had some 40 pound bags of the oil variety for 12 bucks so folks can keep their backyard bird population fed. I might end up experimenting with one of those bags once we figure out the best way to build an oil press. Neat! I've wondered about doing this, so I'll be interested to see how this goes. In particular I'm not sure how to harvest and press the seeds without exerting outrageous effort. You can press the oil plus use a portion of it for fuel to press more oil if you go the diesel route. We'll definitely keep you all posted about our adventures with oil-pressing. Hopefully we can rig some kind of press for relatively cheap. I just discovered your blog and have been reading through lots of stuff. We have been preparing for our move "back to the land" as well. It sells for about $140 and can be attached to an old bicycle frame to really ramp up production. I plan to get one soon and will let you know my results. I'm glad to meet you, Whit! It turns out that one of our friends got that exact oil expeller and we got to see it in person last week. I was excited when I heard about it, but was shocked by how small it was when I saw it. it looks like you'd be lucky to crank out half a cup of oil in several hours with it. I had originally been planning on getting one like it, but now am leaning toward finding or making something larger. My friend hadn't really used it much, though, so my feeling about it could be wrong. If you buy one, please do report back and let me know how it worked for you! Looks can be deceiving. I think you need a lot of pressure for oil extraction. So a larger machine would be implossible to power by hand. You'll see that larger screw presses are usually driven by an electric motor via reduction gears. According to the website (under "performance") you can get between one and four ponds of oil per hour from this hand-cranked press, depending on the seed used. According to their sunflower seed page it does, and unshelled too. Heck, they claim you can even press whole almonds. Mind you, if you chop up big nuts lightly with a blender, it might be easier to get the oil out and/or give a better yield. Clearly I need to have a little more faith! The unit does look amazingly sturdy, like it might last a hundred years with a bit of gentle care. Maybe I can talk Everett into trying out some sunflower seeds and letting me know how it does.